A theme that runs through Wilson’s work is that life is a story. Life is a story that each of us participate in. Indeed, we write our stories every day. But the author maintains, “there is a difference between asserting that life is a story and actually living life like a story. And there is another difference between living life-like a story and living life like a good story.” Living life like a story, therefore, is part and parcel of the Christian life. One reviewer compares Wilson to John Eldredge – what is likely meant to be a compliment. Sure, whatever. I prefer, as I have done elsewhere [See my review: Notes From the Tilt-a-Whirl] to compare Wilson to Dennis Miller, G.K. Chesterton, and C.S. Lewis – no doubt a true compliment! Death by Living is about the gospel but it never comes across in “preachy” tones. It’s a celebration of life lived and ended well. It’s about a life that is lived passionately and faithfully. 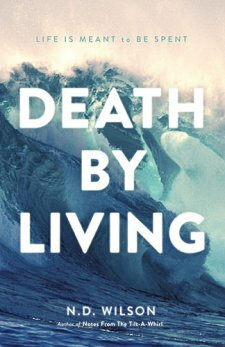 Death by Living is about living with gusto; about living with passion; about living to honor Christ. But real living also requires dying. We are called to finish strong and die well – all to the glory of God!